Staples has a clear lead in the office supplies market. But staying on top will take more than a big red button, says Fortune's Matt Boyle. NEW YORK (Fortune) -- Those attending last week's Manhattan press conference heralding the introduction of office chairs bearing Donald Trump's imprimatur might have overlooked the mild-mannered man standing, somewhat uncomfortably, next to "The Donald" on the dais. While Trump launched zingers at Rosie O'Donnell and naturally hogged much of the spotlight, Ron Sargent, CEO of office products purveyor Staples (Charts, Fortune 500), was content to play it straight. "It was a dog and pony show," he remarked afterwards, shaking his head in disbelief. Is Mackey too wacky to be CEO? While Sargent's approach to business lacks the bombast of Trump's, his results speak volumes. With sales that will approach $20 billion this year from nearly 2,000 stores, Staples has a clear lead over rivals OfficeMax (Charts, Fortune 500) and Office Depot (Charts, Fortune 500) in the office superstore category - one that Staples co-founder Tom Stemberg invented 21 years ago. Sargent answered those questions and others in a recent meeting with Fortune, detailing plans for further growth of the company's burgeoning delivery business, expansion in Asia, and new areas of business that will put Staples in direct competition with tough customers like Best Buy (Charts, Fortune 500) and FedEx (Charts, Fortune 500). In 2006, about a third of Staples $18.2 billion in sales came from its business delivery unit, which ships toner cartridges, copy paper and Post-It notes to customers large and small, as well as to grocery stores like Safeway and Giant. There, the company's "Easy" campaign allows customers to create their own dedicated Web site for quick reordering. Staples' Web site has also undergone an overhaul over the past few years, and the company is now the second-biggest online retailer, after Amazon, according to industry publication Internet Retailer, with $4.9 billion in e-commerce sales. Staples sells about 20,000 items, but only about 7,000 are available in any given store. Over the past few years, Staples has made the site much easier to navigate by actually visiting offices to understand how customers ordered online. Those improvements, and others, have resulted in 15 percent annual sales growth for the delivery arm of the business, which far outpaces the growth rate of its brick-and-mortar side, where same-store sales grew only 1 percent in Staples' most recent quarter. Profit margins for Staples' delivery business, according to Credit Suisse analyst Gary Balter, are among the best in the industry. And Sargent says sales at the delivery arm - recently bolstered by the acquisition of corporate-branded tchotchke maker American Identity - could eventually surpass those from stores. Inside the stores, Staples is trying to sell more store-brand products, which deliver higher gross margins. Five years ago, only 10 percent of sales came from such products. That stands at just over 20 percent today, and the long-term goal, Sargent says, is 30 percent. Staples is also testing small (4,000 square feet) standalone copy centers that would compete with FedEx's struggling Kinko's business. Staples has three in Boston now, and will launch in New York later this year. The company has also launched an IT services business, a la Best Buy's Geek Squad. (The service, called Easy Tech, recently "degunked" Sargent's own computer.) "These steps point to opportunities...to grow share of wallet," says Balter, who currently has a price target of $28 on the stock. Staples' international operations account for just 13 percent of revenues, and its UK business has been a sore spot for some time. But things are heating up in emerging markets like China and India. A store in Beijing just opened, and Staples has won the right to be the exclusive supplier of office furniture to the 2008 Beijing Olympics. In India, a joint venture with local retail giant Pantaloon will soon bear fruit with three stores in that country, one of which, in Bangalore, will be Staples' 2000th store. 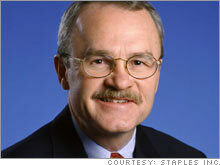 When Sargent joined Staples in 1989, Ohio was a new frontier for the retailer. "I never would have guessed we'd have 2,000 stores and certainly could not have imagined [the 2,000th store] being in India," he says. Nor would he have dreamed about sharing a stage with Trump, we reckon.